An Indian friend stayed with us recently after she had been travelling in Morocco. She was both amazed and horrified to hear I did not know the book In Arabian Nights. “You, a storyteller, and you don’t know this book by Tahir Shah, son of the folk tale collector Idries Shah?” My friend immediately ordered a copy for me, and ordered me to read it. Knowing both the father’s books and the value of following such orders, I unwrapped the book with anticipation. The back-cover blurb promised much: "Shortly after the 2005 London bombings, travel writer and film-maker Tahir Shah was thrown into a Pakistani prison on suspicion of spying for Al-Qaeda. What sustained him during his terrifying, weeks-long ordeal were the stories his father told him as a child in Morocco. Inspired by this, on his return to his adopted homeland, he embarked on an adventure worthy of the mythical Arabian Nights and went in search of the stories and storytellers that have nourished this ancient, vibrant countries for centuries." But then with chapter two the book’s genre becomes more apparent. The autobiographical moves seamlessly into travel writing as Shah takes us through the delights, bafflement and frustrations of living in Casablanca, itself the subject of another of his books, The Caliph’s House. Shah certainly does this well. The domestic incidents, family details and the cast of local characters make for good entertainment. But after a few pages I did ask myself whether the book was going to be stuck in the light-weight travel genre, à la Peter Mayle’s A Year in Provence or Annie Hawes’s Extra Virgin. Were the “stories and storytellers” mentioned in the back-cover blurb going to be no more than a fanciful touch? Was I, as a storyteller, going to get anything out of this? Those doubts were rapidly stilled, and stilled on a number of levels. Clearly it is travel literature, and is assigned to that section on the Random House website. Of course travel literature: how else could a professional author make a living! Yet despite these publishing exigencies, I soon noticed the skillful layering of the various plot lines, so like the tale-within-a-tale structure of Arabian Nights. Furthermore, the genre’s obligatory range of local characters are presented with mature respect. Even when Shah is baffled by what motivates them, we recognise that the limitations are his and that this book is his genuine attempt to learn from an older, pre-literate culture. The process of struggling to acquire the wisdom he knows is waiting for him in that culture, is a process marked by stories. And a central leitmotif of the book is his search for the story he has been told which is waiting in his own heart. And so tales soon come in plenty. 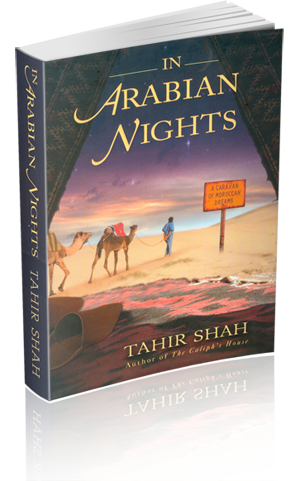 Cleverly woven into the book’s wider tapestry, they are told by the characters Shah meets as he discovers Morocco, or drawn from memory as he recalls the way his father used stories to bring him up. With this device, Shah presents us with story after story, some from Arabian Nights, some linked to his father’s favourite Sufi Nasrudin, some just told as a story. A practising teller will know many of them. Others are a delight to recognise in a new guise (for example, Chaucer’s “The Pardoner’s Tale” in an Arabian setting). “ ‘People think I am a writer,’ he would say, ‘and when they say that they are missing the point. I write things down but the writing is just a tool […] I am really a basket-weaver. I have always told you that, Tahir Jan. I take reeds from the river that have been nurtured in fresh water and grown in good soil, and I turn them into baskets, a product that has so many uses. I know how to make baskets from something so simple because my father taught me, and his father taught him. So there was much for me as a storyteller in the book, in spite of, perhaps even because of, its adopting the guise of travel literature. Moreover, I imagine that as such it has managed to smuggle its wisdom into the minds of many readers who have had little previous contact with storytelling. There is a fair chance the book has been waiting for you since 2008 in the travel section of your local bookshop. Probably that is the reason it has, apparently, gone unnoticed by the storytelling community. The esteemed editor of Facts & Fiction had not heard of it. Nor, it seems, had anyone on the 600-strong international listserv Storytell – although when I posted about it several ordered it immediately. There is more about the book on Shah’s website. Take a look, and you might well order a copy, too. This article will be published in a forthcoming issue of Facts & Fiction and is presented here with kind agreement.